Visiting Costa Rica in August is becoming more and more popular. In fact, in recent years August has been transitioning into high season due to all of the tourist demand, ranging from family vacations, to honeymoons and other types of vacationers. As a consequence, there is some uncertainty as to whether the month pertains to high season or green season. The weather also brings some considerable uncertainty. In Costa Rica, it is known as the shoulder season where the dryer first half of the year is still transitioning into the wetter second half of the year. For Ticos, it is a very special month due to the events surrounding Mother’s Day (August 15) and the nationally honored pilgrimage to La Virgen (August 2). Read on to learn more about planning a trip to Costa Rica in August. Like the rest of the year, the weather in Costa Rica in August is very difficult to predict. It pertains to the “shoulder season” where the dryer days of the first half of the year are transitioning into the wetter days of the second half of the year. Depending on the prevailing weather patterns that year such as the El Niño weather phenomenon, it is quite possible that August could have its fair share of sunny days as well as its rainy days. Temperatures continue to be mild throughout the country. Typically, on the Caribbean, August is actually a month where the weather begins to transition to less rain and more sunshine. Anyone visiting Costa Rica in early August will undoubtedly be awed by the national pilgrimage that takes place leading up to August 2 on the Day of the Virgin de Los Angeles. Catholics from every corner of the country pack a sandwich and a bottle of water in their backpack and set out from their houses on foot to arrive to the Basílica Nuestra Señora de Los Ángeles in Cartago, to pay homage and pray to the patron saint of the country, La Negrita (the Black Virgin). And once they arrive at the basilica, many of these pilgrims fall to their knees and travel the final 100 or so meters on their knees, to ask prayers from the Virgin or to thank her for a miracle that they’ve experienced. As a result of so many pilgrims, there can be significant traffic delays around Cartago each August 2nd, but most people don’t tend to mind since it is such a sight to witness. August 15 is perhaps the most important day of the year in this peaceful, matriarchal country. Mother’s Day is not only universally celebrated in Costa Rica, but it is also a national holiday, with banks and schools closing. For weeks, even months, leading up to August 15, stores advertise sweet-smelling perfumes and decorative gift ideas for mothers and schools prepare elaborate child-made picture frames or vases for the mothers of Costa Rica. Families usually celebrate the day by sharing a meal of arroz con pollo and a dessert of tres leches. Hardly ever an actual “day-off” for moms, it is oftentimes an opportunity for them to put together an enormous feast for their family. Each county in Costa Rica finds the opportunity to celebrate its heritage. On August 30, the lovely town of San Ramon — located between San Jose and Arenal — holds a huge parade where statues of 30 saints are processed through the streets. Carnival food and other festive activities accompany the event. Given that rain is more likely in August, you will want to make sure to bring quality raingear such as a lightweight raincoat and a compact, travel umbrella. Strap-on sandals that can get wet are a good item to have because they will give you more support than a typical pair of sandals, but they can dry easier than a pair of tennis shoes for example. For more information on what to pack for a visit to Costa Rica, visit our detailed Costa Rica Packing List article. Museums & City Tours – Historical museums and cultural tours in the capital city of San Jose or the colonial capital city of Cartago have only improved over the past decade, and they actually have a lot to offer visitors to Costa Rica. Bonus: Plan a trip to Cartago on the day of the national pilgrimage and you will have a very unique cultural experience! Sea Turtle “Voluntourism” or Observation – The magnificent green sea turtles are hatching during this period and nature lovers can join a tour or a volunteer project in order to witness the process. White-Water Rafting – High waters can make Costa Rica’s rivers especially fast and thrilling. If you’re interested in an adrenaline rush, let a professionally trained rafting guide show you one of Costa Rica’s rivers in August! 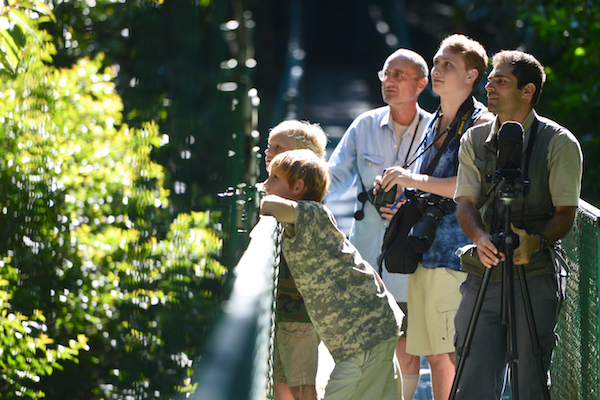 Hanging Bridges Guided Hike – A peaceful walk along the canopy is a wonderful, family activity anytime of the year. Tour of Churches – Join a bilingual guide on a customized tour of colonial churches throughout the country. There is some uncertainty to visiting Costa Rica in August due to fluctuating prices and weather patterns. However, most activities — including the annual pilgrimage to the Basilica de Los Angeles — take place rain or shine.